Our product range includes a wide range of designer saree, fancy saree, fashionable saree, embroidered sarees, stylish partywear saree and fancy designer saree. 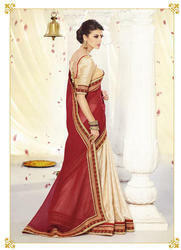 We are offering Fashionable Saree to our valuable customers while keeping in mind their demand. We offer product to meet the satisfaction of customers by our best product. Full Set : 17 Pcs. Description: This Exclusive Grey With Red Pallu Color which give gorgeous look ,this designer saree embroidery work on in floral pattern.Saree is especially ready for any ceremony. Our reputed organization is engaged in offering a wide gamut of Fancy Designer Saree that is delivered after testing on well defined parameter of quality. Our offered saree is designed using quality assured fabric and latest technology under the supervision of our skilled designers. Further, we are offering this saree in variety of colours, patterns and designs. In addition to this, our offered saree can be availed by our clients at industry leading rates within stipulated time-frame. Description: This Exclusive Navy Blue With Pink Pallu Color which give gorgeous look ,this designer saree embroidery work on in floral pattern.Saree is especially ready for any ceremony. With the inclusion of advanced techniques, we are engaged in offering a wide gamut of Fancy Designer Saree. The saree offered by us is designed using optimum quality fabric and latest machinery in adherence with set industry norms. Being a quality centric organization, we assured our clients that we are delivering defect free saree in various colours and designs as per their requirements. Our offered saree is highly demanded for its elegant design and attractive colours. Description: This Exclusive Saree made of Georgette Fabric in Maroon Beige which give gorgeous look,this designer saree embroidery work in floral pattern.And these multicolor saree is especially ready for any ceremony. With the help of diligent and adapt professionals, we have been able to offer our clients a qualitative range of Fancy Designer Saree. The offered saree is designed using best in class fabrics by our experienced workforce in observance with ongoing fashion trends. We offer this saree in diverse colors, and patterns as per the choice of customers. Our valuable clients can easily purchase the saree from us in a confine time at affordable rates. Description: This Exclusive Cream With Maroon Pallu Color which give gorgeous look ,this designer saree embroidery work on in floral pattern.Saree is especially ready for any ceremony. Description: This Exclusive Light Brown With Pink Pallu Color which give gorgeous look ,this designer saree embroidery work on in floral pattern.Saree is especially ready for any ceremony.